The Game told a $5,750 bald-faced lie about dropping a massive tip on a waiter -- at least according to the waiter himself ... KRS has learned. First, Game's version of what went down. The rapper had an Easter Sunday meal at Capital Grille in West Hollywood ... and then tweeted about leaving a $6,000 tip for his waiter, Eme Ikwuakor. 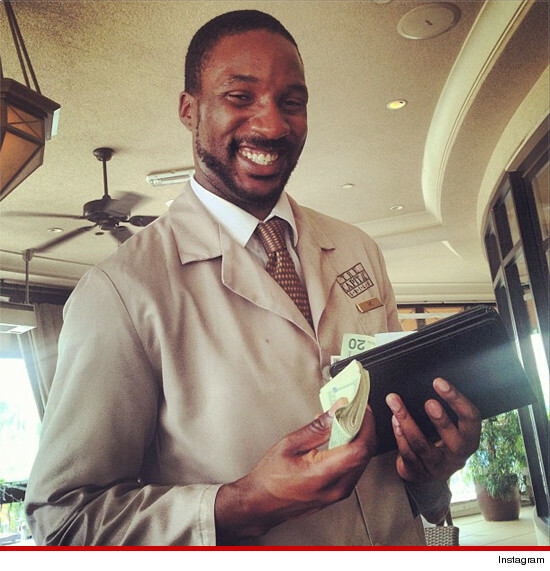 But now Ikwuakor wants to clear up a few things ... as in a few less zeros on his gratuity. According to the waiter ... Game handed him a large bundle of cash, and then snapped the photo (above) ... which went out to Game's 1.1 million Twitter followers. Ikwuakor admits he consented to the pic, and appreciated Game's Twitter shout out -- but says the actual tip was only $250. Not that he's complaining ... in fact, Ikwuakor says Game and his fam were great customers and the $250 was "very generous and much appreciated." He's assuming the $6k was just a practical joke ... though we doubt the IRS would be laughing. We called Game to clear things up ... but, so far, radio silence.